“Department of Living Animals, Smithsonian Institution,” Histories of the National Mall, accessed April 22, 2019, http://mallhistory.org/items/show/233. A bear, an eagle, badgers, and buffaloes comprised the original exhibition of the Department of Living Animals on the south side of the Smithsonian Institution Building. Opened to the public in 1887, the Department's live exhibits gave Smithsonian taxidermists an opportunity to observe the habits and positions of various animals and to use this knowledge in mounting collections and exhibitions. Under the direction of William Hornaday, the Department of Living Animals was the forerunner of the National Zoological Park, established by an Act of Congress in 1889 for "the advancement of science, the instruction and recreation of the people." 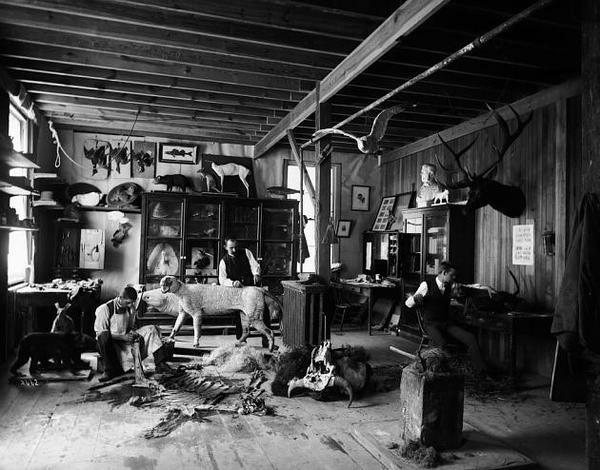 The taxidermists' laboratory was located in a shed in the South Yard behind the Smithsonian Institution Building.